This medium-sized parrot with the lengthy name is one of the most popular pet species of the Amazon parrot group, thanks to its striking color and its unsurpassed mimicry ability. The double yellow-headed Amazon parrot that can even learn to mimic opera singing, which may be why it has been kept as a pet since the 1500s. It is the best mimic of all the Amazon parrots, and is second only to the African gray parrot in its ability to learn words and phrases. The double yellow-headed Amazon parrot is also known more simply as the yellow-headed parrot or the yellow-headed Amazon. The taxonomical name for the double yellow-headed Amazon parrot is Amazona oratrix. Native to Mexico and Central and South America, this parrot's natural habitat is forests and woods near water. 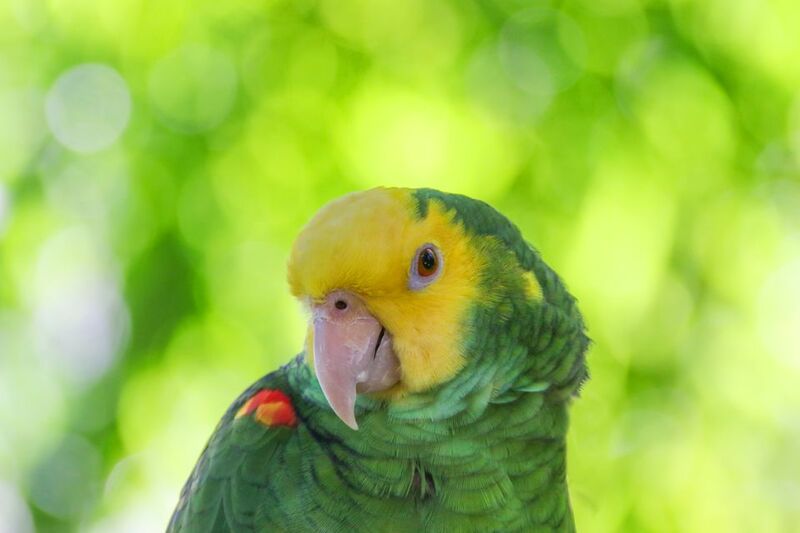 Habitat destruction and heavy capture for the pet trade have seriously compromised the numbers of the double yellow-headed Amazon parrot in the wild; only a few thousand wild birds remain. This parrot is listed as an engangered species by the International Union of Conservation of Nature and Natural Resources, and international treaties now make it illegal to capture, export, or own wild-caught birds. Captive-bred birds can be legally sold and owned, though documentation is required. A few introduced populations of double yellow-headed Amazon parrots live in diverse locations, including Stuttgart, Germany and several locations in southern California. When it reaches maturity, the double yellow-headed Amazon usually measures between 15 and 17 inches from its beak to the tip of its tail, making it one of the larger parrot varieties. Double yellow-headed Amazons can live to be more than 60 years old on average, which makes them good longtime companions. Some birds have been known to live 80 years or more under ideal conditions. When hand-fed from a young age, these birds can be affectionate pets. They're intelligent and have remarkable "speaking" ability, and they love to be the center of attention. However, problems may occur when an owner is unwilling or unable to give the parrot the attention it demands. Like many parrots, double yellow-headed Amazons may go through a hormonal bluffing stage as they reach sexual maturity. They can become aggressive and may lunge and bite at people during this phase. If you're prepared for the bluffing behavior, which can last for several months (and sometimes up to two years), then the double yellow-headed Amazon could be a good option for you. But if you have small children who will be interacting with the bird, it may be better to choose a different species. The double yellow-headed Amazon has a tendency to bond with one designated family member; if this is not acceptable, make sure that multiple family members handle the bird regularly, especially when it is young. Hand-feeding by all family members will reduce the bird's tendency to bond with one person only. This is a noisy, boisterous bird, prone to screaming sessions twice a day, at dawn and dusk. This is normal behavior for this species, but screaming can become a problem when the bird screams all day long, which can happen when the bird is bored due to lack of attention. As its name suggests, this bird has a yellow head; the rest of its body is the familiar parrot green. There is a ring of white around the eyes, and the beak is horn-colored. In young birds, the head includes some dark gray, but gradually, the head becomes steadily more yellow with each molt. In young birds, there are small areas of red on the shoulder. The full adult head color is not present until the bird is at least 6 years old, and the ratio of yellow may gradually increase as the bird ages. If you're interested in owning a double yellow-headed Amazon, contact local bird breeders to see if you can schedule a visit with them and their birds. It's unlikely you'll be able to find a healthy (and authentic) double yellow-headed Amazon at most pet stores. If you're able to get to know the bird a little before bringing it home, you'll gain a little insight on whether it will be a good fit for your lifestyle. The double-yellow headed Amazon is an athletic bird that likes to clamber around its given area, and it loves to fly if there is enough space. It is a strong bird that can be destructive; cage materials should be made of sturdy steel. Give your bird the largest cage that is practical, and fill it with toys. At a bare minimum, a cage should be 34 inches square with a play gym on the top. Equip the cage with perches of various dimensions. Make sure to provide this bird with toys that can be destroyed, such items made from wood, leather, and acrylic that it can joyfully tear apart. Without enough toys to shred, this bird can set its sights on furniture and other belongings. Challenging toys are a must for this bird: a bored double yellow-headed Amazon will quickly become a destructive one. All Amazon parrots thrive on social interaction, and they need it to remain healthy and happy. Birds that are neglected can become destructive and depressed, which can manifest itself in various physical and emotional problems. To establish and maintain healthy bonds, you must set aside time each day for one-on-one interaction. The double yellow-headed Amazon is capable of learning many words and phrases and is notable for learning songs, especially opera. These parrots should be showered regularly to ensure the health of the skin and feathers. Like all Amazon parrots, a double yellow-headed needs a high-quality pelleted diet supplemented with seed mix and daily servings of fresh bird-safe fruits and vegetables. A varied diet will help ensure that your bird is getting the balanced nutrition it needs. Make sure the bird is offered foods high in vitamin A are important, as this bird is prone to deficiency. Calcium is also important for the double yellow-headed Amazon parrot. Amazon parrots are prone to excess weight gain, so it's important that they are allowed daily exercise. In order to properly care for a double yellow-headed Amazon parrot, you should be able to give it a minimum of 3 to 4 hours outside of its cage per day. As with any species, regular exercise will allow the bird to burn excess calories and stretch its muscles; it also provides essential mental stimulation. All Amazon parrots are prone to becoming obese if they are fed too much and exercised too little. Amazon parrots are also prone to polyomavirus, which can cause anorexia and weight loss; chlamydiosis, which causes fluffed feathers and nasal discharge; and vitamin-A deficiency.